Landrace (Silverleaf) – Lots of different types from small “field bean” types to bigger commercial ones, from plants that did well for me last year. They’ve likely cross-pollinated like mad but that was what I was aiming for! Some of my seed last year was a landrace from France which was mostly small field bean types crossed with larger commercial types which had been selected for cold tolerance and therefore are suited to autumn sowing, the rest of my seed was as many different commercial types as I could easily find. Half were winter-sown, half spring-sown, all germinated well and produced well despite it being a horrible summer for blackflies and extremely windy here when the plants got tall. I found that the smaller-seeded plants produced significantly earlier and resisted aphids much better. They obviously have smaller seeds and there are fewer of them in the pods (sometimes only 3) but there are a lot more pods so it balances out! My hope is that we’ll get a really good diverse mixture with these, and if you save seed you’ll naturally select for the ones that produce best for you. An article in the Telegraph adds more information about the seed company that sold this variety (now long discontinued): Ryder’s top o’the pole was from the seed company of Samuel Ryder, who donated the trophy for golf’s Ryder Cup. 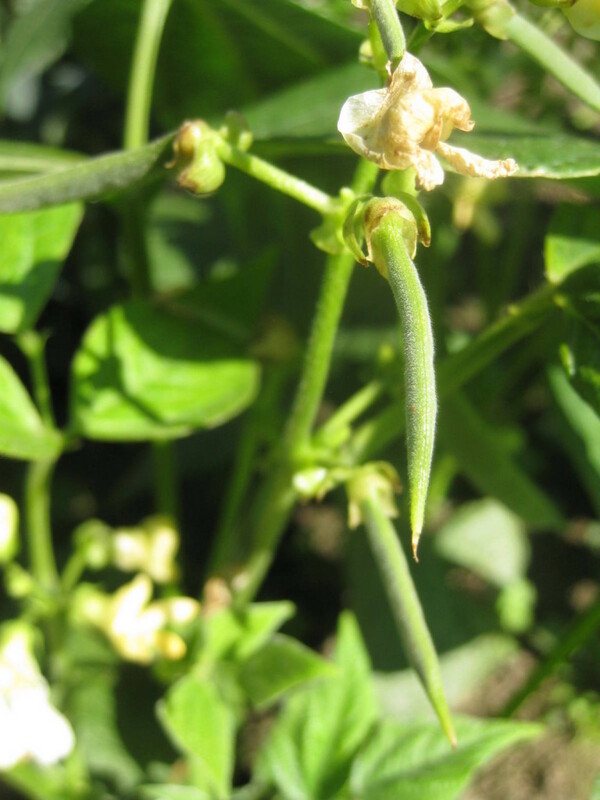 Mariazeller – I received 3 seeds of this dwarf French bean in 2015 (from AJ). All germinated but I lost one plant to a munching gremlin! Pretty white flowers fading to cream, they gave a nice set of beans , I think best enjoyed dried. Galina did a little digging around and found this variety originated in Austria before traveling a whole lot of miles before coming to me and now the Seed Circle. Mariazeller dfb, baby beans. Picture Jayb. 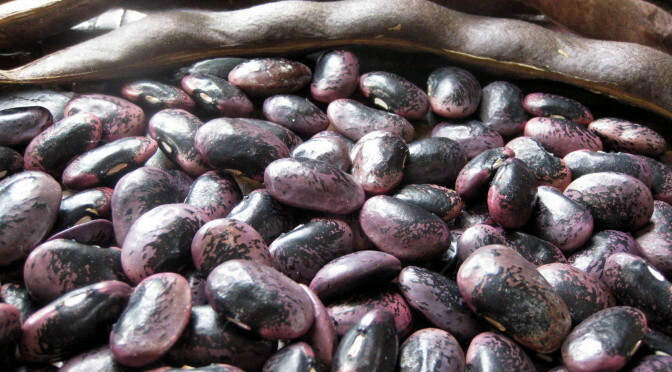 Red Swan – Red Swan is a modern bean and a world first: it has dusty rose red coloured pods (which cook to green), a new colour for beans. 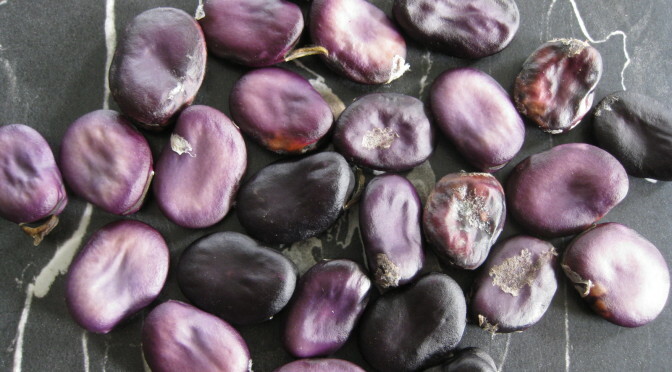 Bred by Robert Lobitz, a cross between a purple snap bean and a pinto bean. Red Swan beans. Picture Jay. A bit more information from Seed Savers Exchange about this very rare bean. Swedish Brown – popular dry bean from Sweden, used for casseroles and soups. 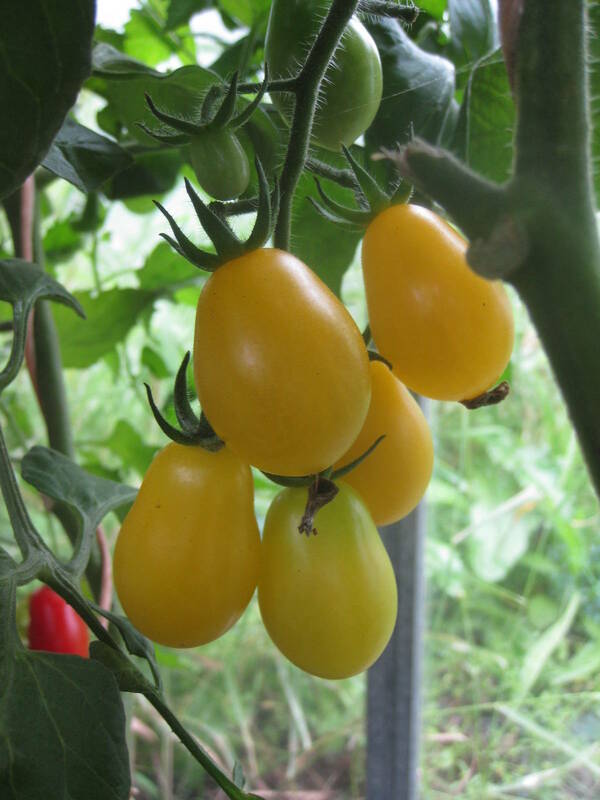 Trofeo – a modern variety, fairly early to crop with great production over a long season. 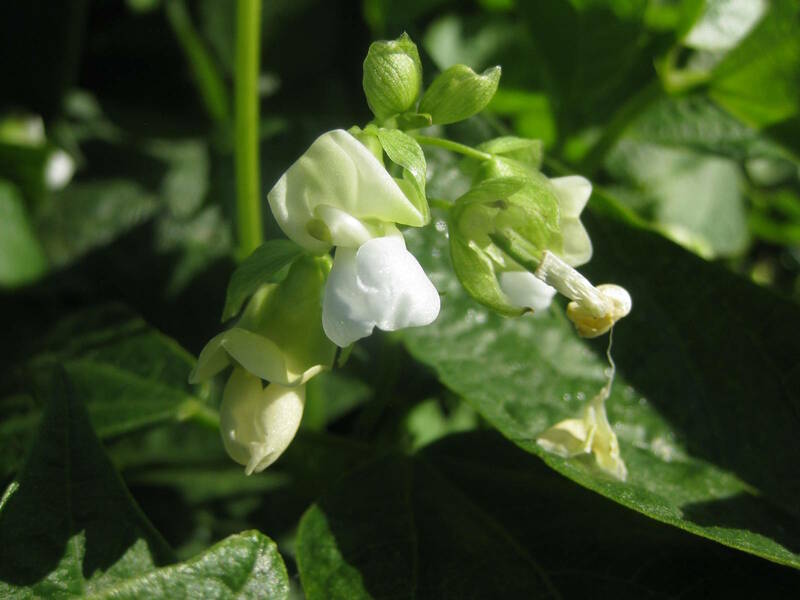 The plants are quite upright and have lovely white flowers which are followed by dark green beans, which are long, fine, stringless and very tasty. They are one of my favourite dwarf beans. Only small drawback, it is white seeded so may need a little care when germinating, although I’ve not experienced any problems over several seasons. Mystery Brassica – Ruud thinks it is either Florida Broadleaf Mustard, Sutherland Kale or something else – we will see and add a description. 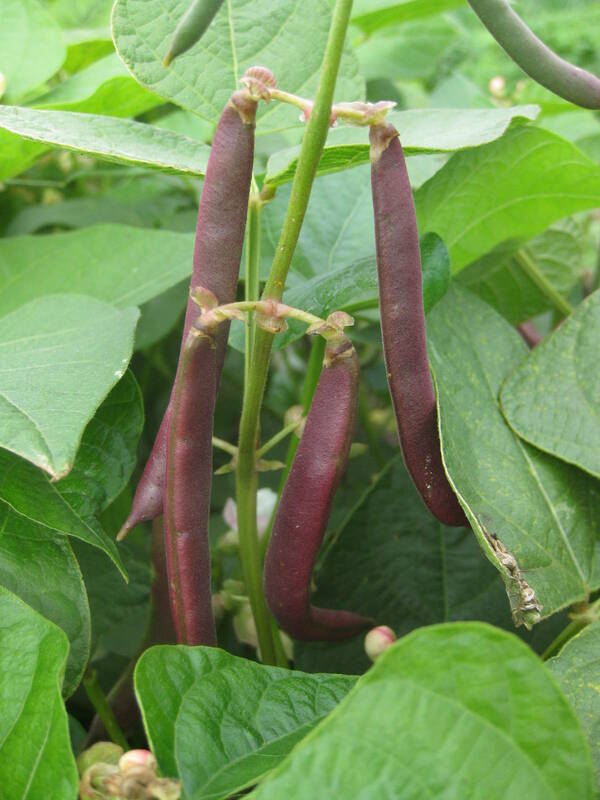 Hannan Popbean – Dead easy to grow and they don’t mind neglect. 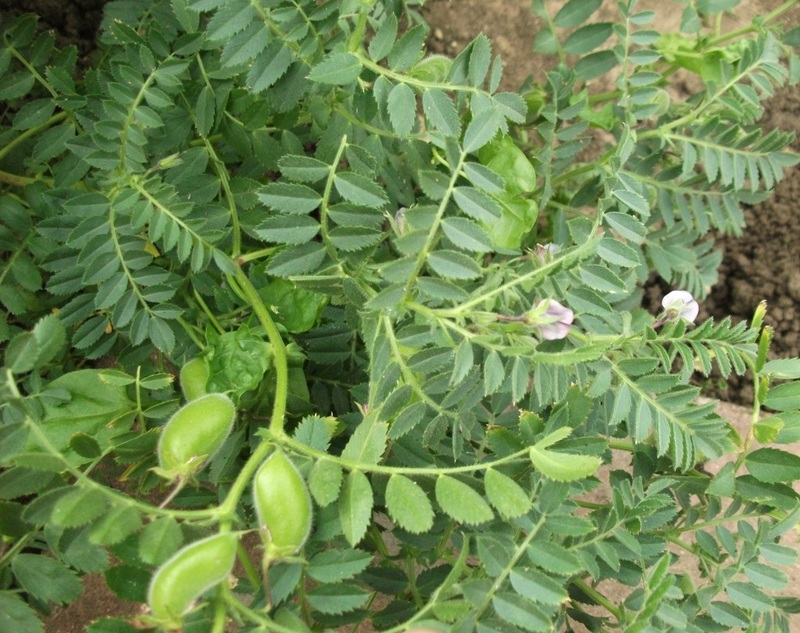 They taste nice raw or cooked fresh like peas, and this variety pops in hot oil when dry as well. I’ve tried popped chickpeas before and they are yummy. They don’t puff up huge like popcorn – more of a split than a pop. I recommend seasoning with salt and smoked paprika or ras el hanout or even a Cajun or Mexican spice mix, they can definitely take spicing. Black/brown chickpeas like this one are smaller, firmer and taste nuttier than the cream-coloured ones you get in cans. Autumn Olive (Eleagnus Umbellata). 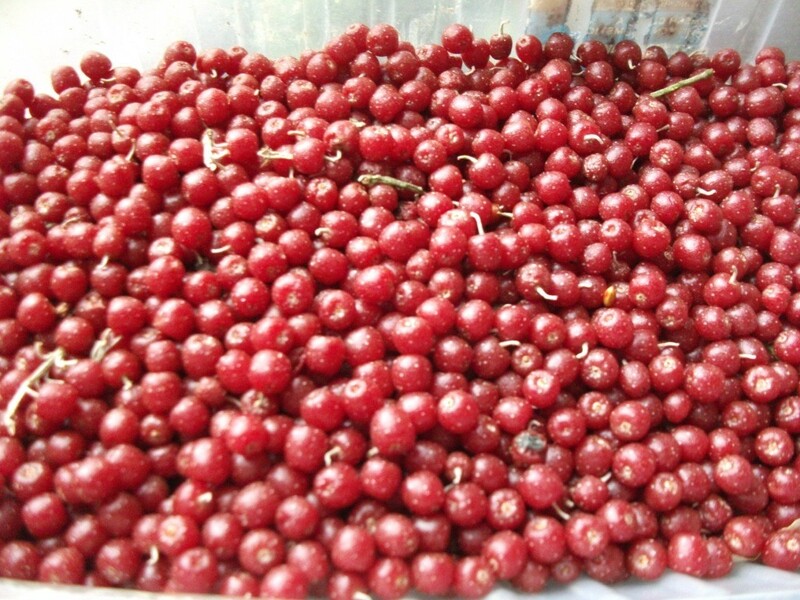 This is a large bush to small tree with bright red fruits in clusters that look like redcurrants with tiny golden dots. A box full of fruit. Picture Galina. The seeds need to be cold stratified before they will germinate. There are several ways to do this. Either leave a pot outside over winter for germination in spring. However I have never had a single seed germinating spontaneously from dropped fruit here. In parts of North America where Autumn Olives are considered naturalised this is obviously different. Here it may be more successful to cold stratify in the fridge. I stratified my seeds in a small amount of damp compost inside a plastic fast food container for 3 months in the bottom of the fridge. Afterwards they germinated within a few weeks in warmer conditions indoors. I pricked the little plants out into individual pots and planted them in the garden during summer. They are fully winter hardy and will start producing about 6 years after sowing. I cannot determine whether they are self-fertile, it may be safer to plant more than one. This is a great variety for a forest garden, a wild-life part of the garden or hedge. The bushes are to 3m tall with long, soft, thin branches that can be easily pruned. Autumn Olive produces pale yellow flowers in clusters with an amazing perfume that wafts over the garden. The berries are produced late in the season during September and October, quite sharp earlier on but much sweeter later. Achocha Bolivian Giant – a late season cropper, enjoying the cool and shorter days of the autumn season. This is my first season growing this variety and they proved to be vigorous climbers grown inside a poly tunnel, I expect they would manage well enough in a sheltered sunny spot outside, though cropping might be a bit reduced. The fruits are quite a bit larger than both the regular type Slipper and Fat baby varieties. Taste is on a par with the other types, though these are an ideal size for stuffing, plus they are have thicker flesh. I sourced these from Real Seeds, two types of seed were in the packet, a smooth rounded and a rough irregular type. Also noted on the packed ‘some fruit are spinier than others’. It’s possible they have been supplied as a mixed landrace variety, you might get some variation in future generations and hopefully there will be some adaptation to local growing conditions . Cinnamon Vine (Dioscorea batatas) – what is in the packet are not seeds, but aerial tubers. These are identical to the big storage tubers produced in the ground, just much smaller. They are produced in the leaf axils of this vining plant during autumn. Aerial tubers are edible same as the tubers in the ground, but the big storage tubers can reach several pounds in weight. What I dig up generally is more the size of baking potatoes. If you leave them in the ground for several years they will get much larger. Cinnamon vine, also called Chinese Yam tubers have a pleasant, fairly bland taste. The texture (cook like potato) is interesting – somewhere between a floury potato and shortbread. Plant the aerial tubers into little pots in gentle warmth (window sill) where they will sprout leaves a few weeks later. After the last frost they can be planted out. I have my plants in the greenhouse, but certainly in the South this is not necessary. The plants will want to take over. I tie the stems together and feed them along the sides of the greenhouse to have space for other plants. They certainly don’t mind this. But if they can scramble over a fence or a sunny shed wall so much the better. Mine die down in winter and resprout every spring from bits of storage roots left in the ground. During summer they develop very insignificant tiny white flowers with a delightful cinnamon perfume – hence the name. It can be tricky to dig up all of the storage roots because they can go down quite deep. I know of a gardener who planted cinnamon vine in a half blue water barrel and just tips the barrel over at harvest time during late autumn/winter. Dahlias apparently used to be grown exclusively for their tasty yam-like tubers. Nowadays this has been forgotten. Time for a revival! As the lovely flowers are also edible, a very useful allrounder and pretty to boot. James Wong has further information. Greek Cress – Greek cress forms small florets (~3” across) so can be used as a catch crop between rows of larger plants and to be harvested before those larger plants attain full size. They can also be sown after midsummer to be eaten in spring (martinburo). 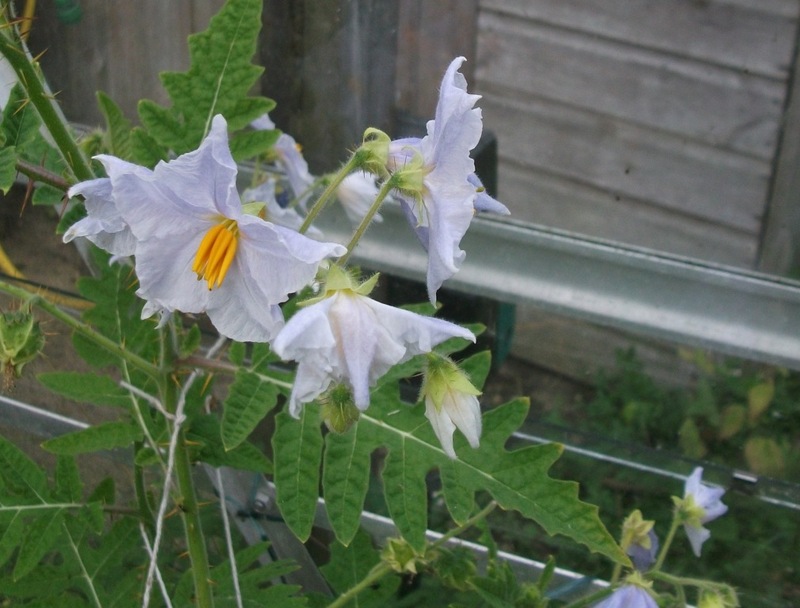 Litchi Tomato (Solanum sisymbriifolium) – This was my ‘little greenhouse exotic’ for 2015 and with a bit of luck it looks like they might be staying in 2016 too. The plants are slightly frost-resistant and – fingers crossed – so far they are still surviving. Grown just like tomatoes, but they can be planted a lot closer and will end up at 4-5ft tall. The plants themselves are spiny and scratchy, best not planted where you are likely to brush against them. Mine are tied to the greenhouse uprights to make sure they stay put! The colour of the large flowers is interesting. The same flowers can be pure white and a week later pale sky blue. Not sure why – intensity of daylight? White to light blue flowers of Litchi tomato. Picture Galina. 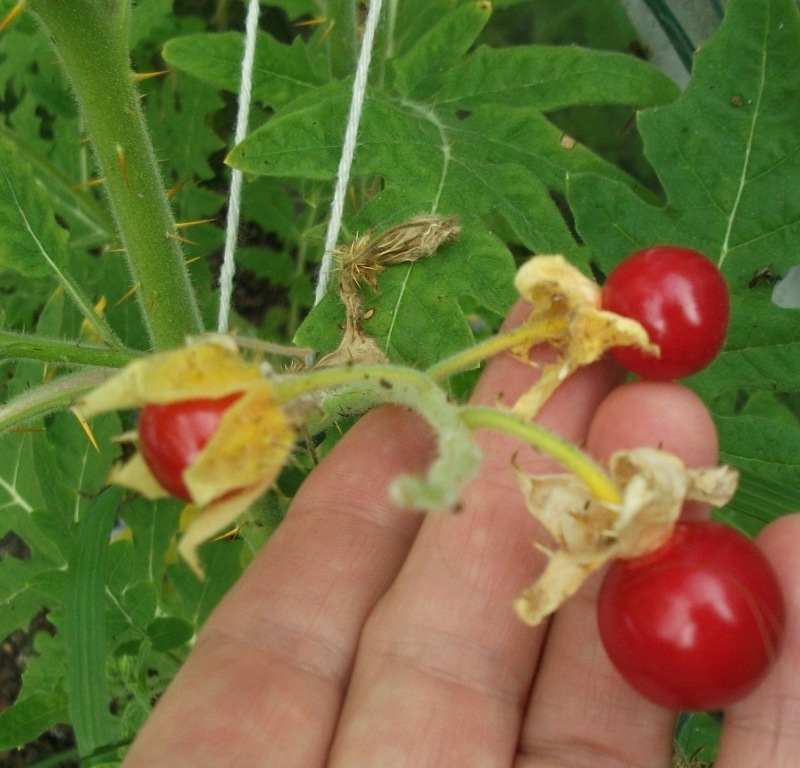 The fruits develop a little slower than tomatoes and are bright red and cherry sized. I find their alternative name of ‘Morelle de Balbis’ very fitting, because their flavour is similar to morello cherries. It is actually very easy to harvest the fruit without damage from the spines, because the calyx opens wide when the fruit is ripe. Comparing notes with Jayb we discovered that there are no named varieties and we had slightly different leaf shapes too. I got my seeds from the Austrian organic growers seed label ‘Ja natuerlich!’ Jayb’s were from Baker Creek seeds in the USA. This fruit would obviously benefit from further selection by gardeners. I could have listed these in the fruit section, because the little ‘tomatoes’ taste more like morello cherries to me. Marjoram – perennial herb. Great for mediterranean dishes. I grow parsley roots every year because we love them. They are slightly smaller than parsnips, but a similar texture and have a hint of parsley taste to them. They are cooked in the same way. I tend to use a lot of the leaves as parsley too, with no detriment to the root’s development. Salsify – Salsify is one of the lesser known hardy winter root vegetables, (together with scorzonera). During winter/early spring we harvest the roots, scrub and boil. The roots are about the size of a carrot. Flavour is mild and frankly, I can’t taste the oyster flavour that has given rise to the alternative name of Oyster plant. I have selected the largest roots, replanted and the seeds are all from this selection. With a bit of tlc and spacing of 6-8 inches per plant, the roots will grow much bigger. The spring leaves make useful greens, when not much is available in the garden. When the pretty blue/purple flowers develop, the roots will have become woody and useless for the kitchen (different from scorzonera where the roots stay edible). Salsify can be grown for roots with a little tlc, or as an undemanding flowering plant in the front garden that self-seeds every year. Self-seeding (with a little weeding if the plants are too closely spaced) makes this vegetable a part of the low-maintenance perennial garden. This is a useful addition to summer leafy greens and quite an architectural plant. There’s no denying the flavor is ‘mild’ compared to things like spinach, but this is good for the time of year when things like that don’t do well – on my plot anyway. I cooked it very lightly steamed, just until barely wilted. If you go any further it starts to taste slimy. You could also use it in salads, but I didn’t. It makes a very attractive, conical-shaped plant with tiny white flowers (still no impairment to flavor at the flowering stage). The photo is at about half to two thirds of full height (eventually about 5 foot), at which point the leaves are more spaced out and it looks more shapely. I don’t have a photo of its latter stages. I think it would be good to have two or three somewhere – not as a staple, but an occasional vegetable. Good looking. Brown Bath Cos – OS HSL. 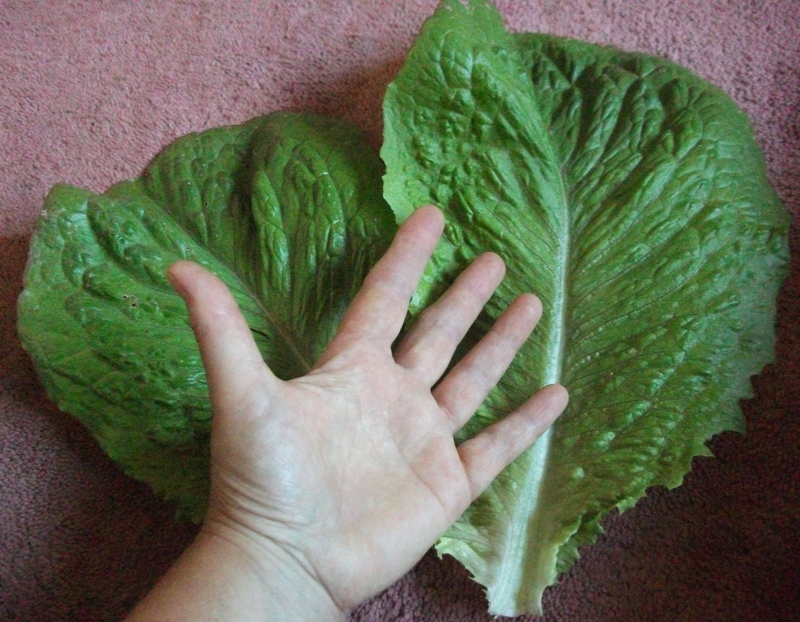 This must be the largest cos lettuce around and a very old variety to boot. Did super well for me and produced huge plate-sized leaves with pretty pinkish brown edges on the central leaves. Is there a giant lettuce class in shows? This one would be t h e candidate to win it. The leaves are large, crunchy and tasty. Picture Galina. Here is the HSL description: Listed in James Carter’s ‘Catalogue for a Choice Collection of Floricultural, Vegetable and Agricultural Seeds of 1842, this variety was described by a contributor to The Gardener (1867) as “ought to be in every garden. No other variety can surpass it”. Thought to be synonymous with ‘Brighton Cos’, the large, dark green leaves have a rust coloured tinge and are flavourful, crisp and juicy. 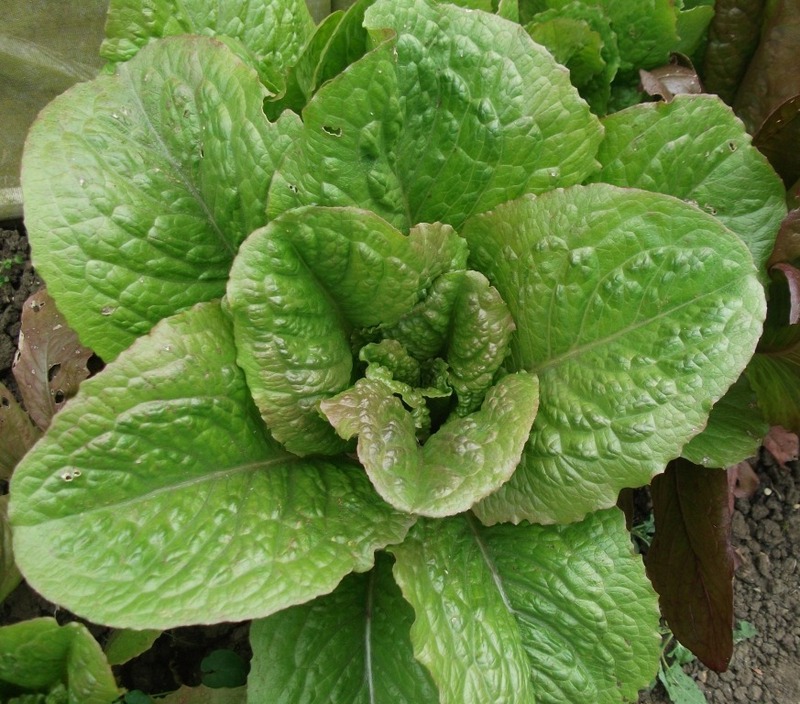 Cimarron – also a cos lettuce, but largely red. 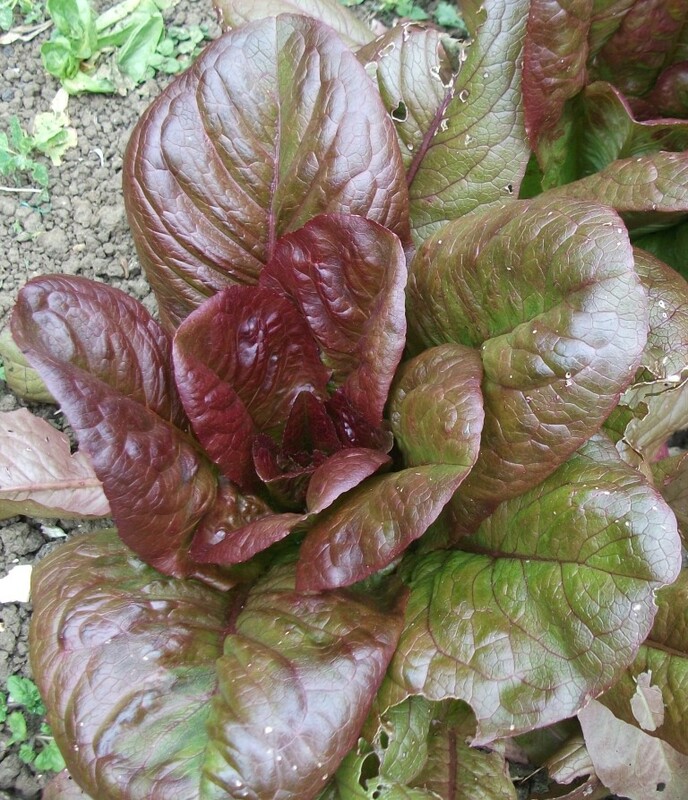 Red lettuces are not only pretty in the salad bowl, but they are also slightly less at risk from slug damage. Lovely red cos lettuce. Picture Galina. 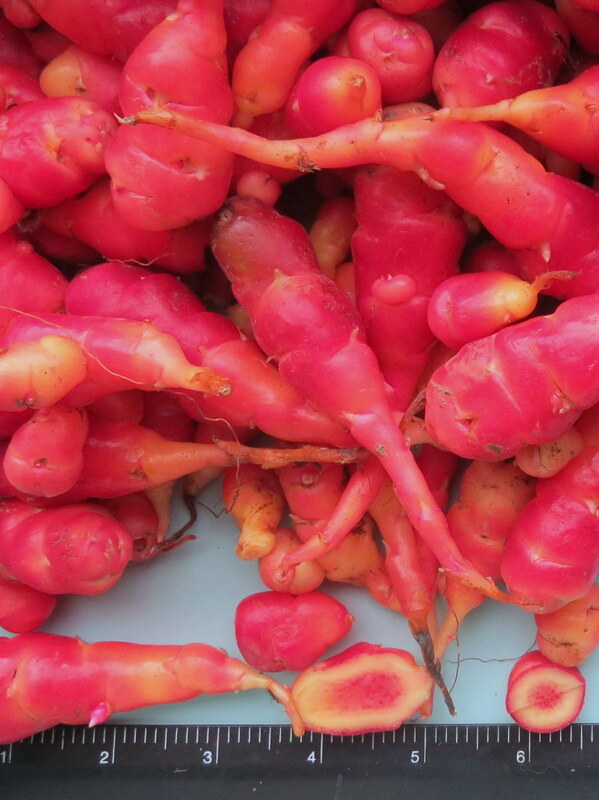 Three new Oca varieties selected from over 40 different True seed plants sown and grown spring and summer 2015. These three plants cropped at over 1kg. 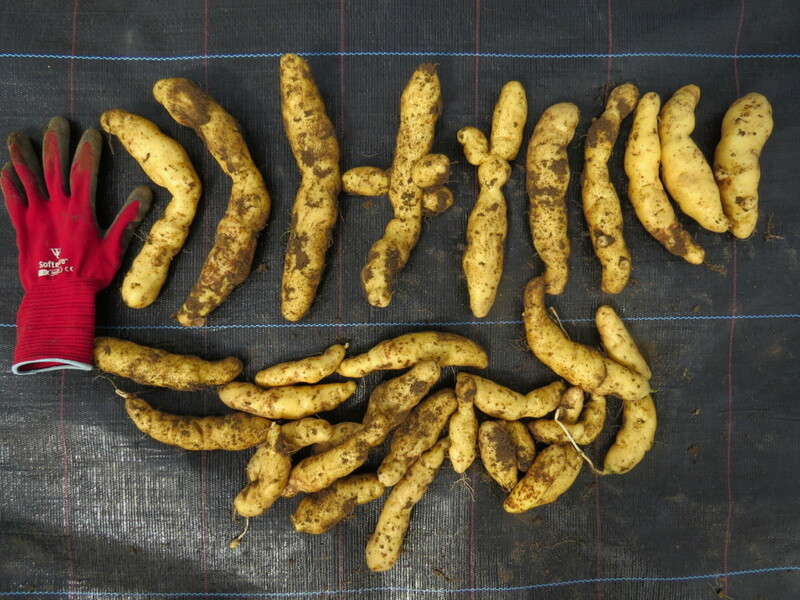 They were harvested at the end of November and they may have potential for bigger crops grown from tubers and left in the ground longer before harvesting. I’ll be very interested to know how they grow through the season and crop for you. Many of thee plants I grew last year produced flowers and set seed, hopefully these will too! “The parsnips are F3 hybrids of about 5 different varieties. Parsnip seeds lose viability quickly to about 5% after 21 months (i.e. spring 2017), so use it or lose it.” Martinburo. I make no excuse for adding this variety again, because it was such a boon last year when our broad beans did badly. Easy to grow and aphid-free. Mrs Lei – my seed source was Jayb – this is a 5ft tall mangetout pea, with excitingly pretty flowers and medium sized green mangetout pods. A pink flowered variety like pea Elisabeth (swapped a few years ago), but these are a paler pink. Different also from the darker, more orangey pink of the Crown Peas that were also shared in this circle. Real front garden stuff, and with excellent eating quality. 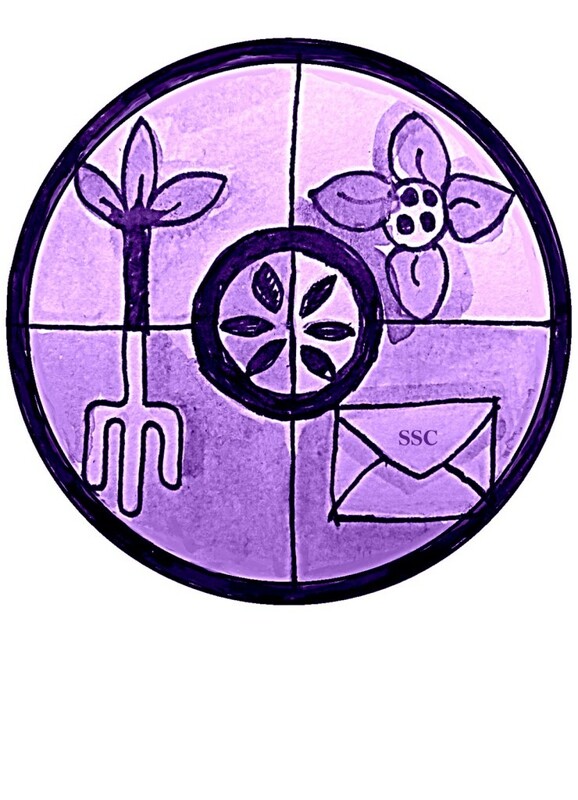 Robinson – OS HSL, but my source was Lorna Noble, a seedsaver from Scotland. The vines are half-tall around 4-5ft and need support. The slightly curved pods are filled with 9 large sweet shelling peas and they are a whopping 6 inches long! A true exhibition pea! 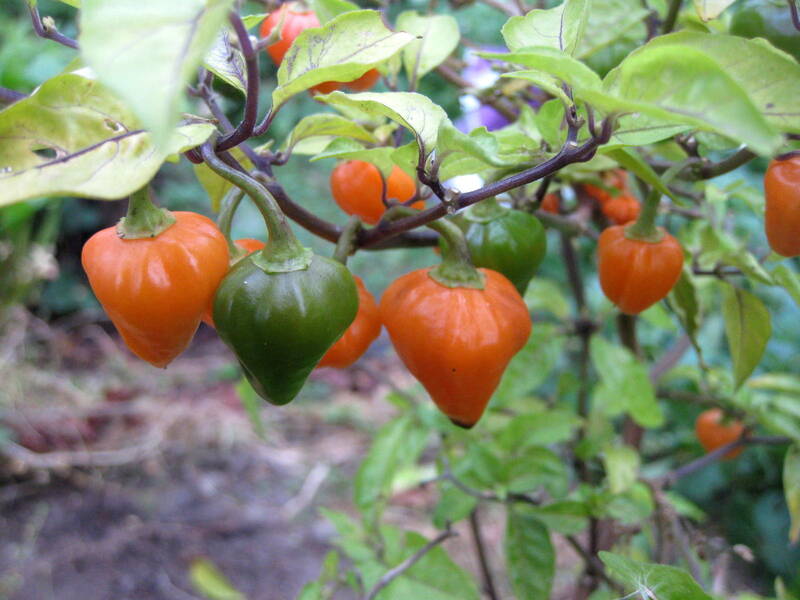 Lantern (Capsicum chinense) – A pretty chilli plant which makes a nice shape, the stems can look quite dark purple which contrasts beautifully with the green foliage. 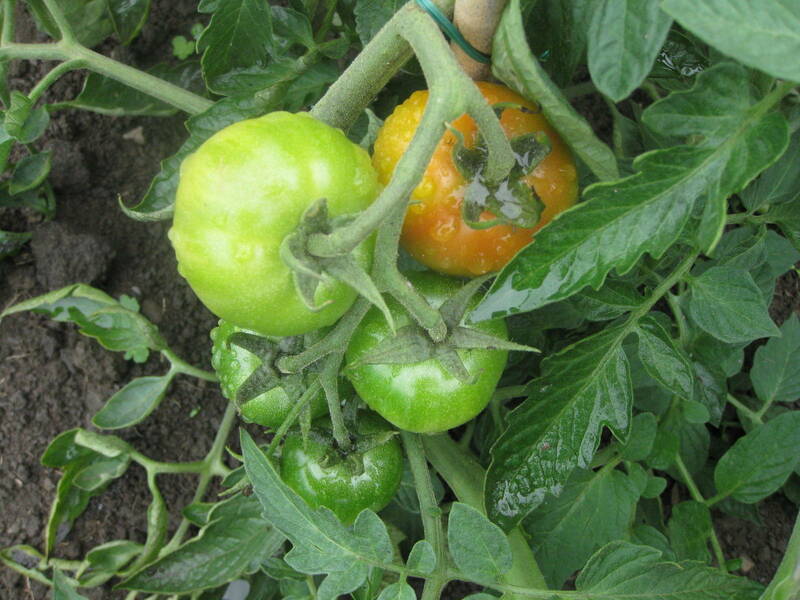 The plants set lots of little green lantern parcels which ripen to a vibrant orange. 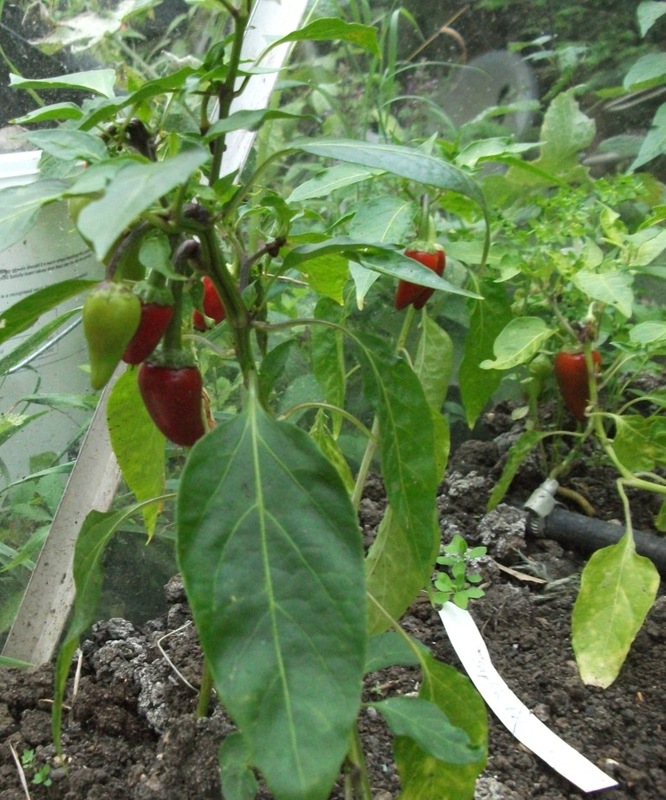 Quite a fiery chilli and a nice size for using, the cut ripe fruits have a delicious fruity aroma. Easy to grow and I’ve found they will overwinter with little trouble. I bought this variety several years ago from Real Seeds, I’ve not seen it listed the last few years and no further history was given. Sipka Belaja – Sipka Belaja is a traditional spice pepper from Hungary. 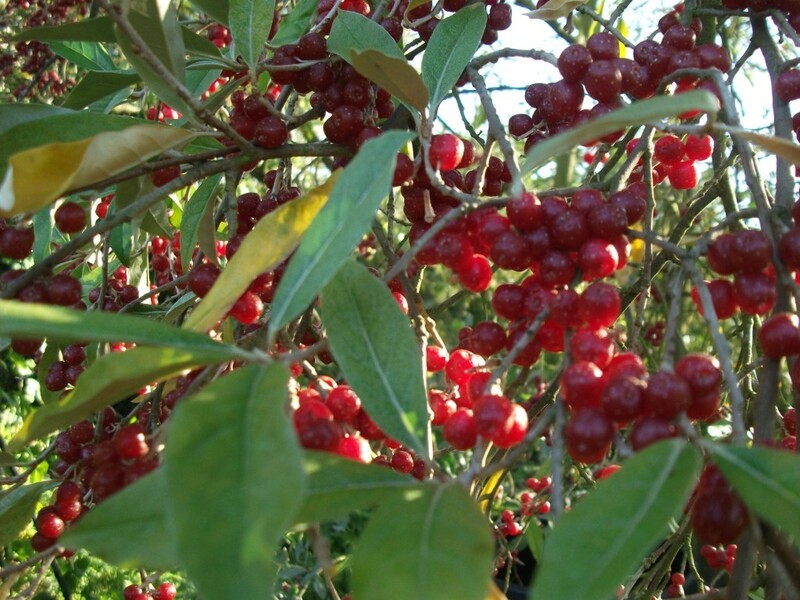 The small plants produce prolific 1 1/2 inch dark red fruits. I grew them both outside and in the greenhouse. Predictably the yield was much higher in the greenhouse. Hungarian medium hot pepper. Picture Galina. These pretty peppers are hot but not dangerously so – half a pepper for wimps and a whole for lovers of flavoursome spicy foods. 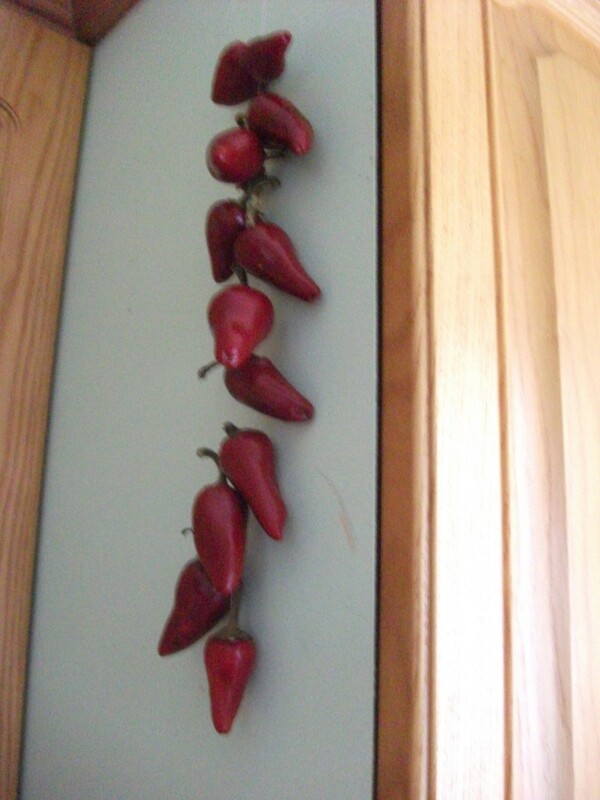 They are thin-walled peppers which means they dry beautifully. I string them up and leave them hanging until they are needed. The dried peppers I used for harvesting our seeds, I crushed with my hands for ‘pepper flakes’ and the last batch that was still fresh, I split and put in the freezer. With a spice mill they could be ground to medium hot paprika powder. Hungarian Orange – Carrot shaped orange peppers, nice and not too hot. Highland Burgundy Red – a red skinned and red/pink fleshed heritage main crop variety, floury type, will set berries. This year’s seed potato. Snookie – this is a homebred elongated fingerling, waxy salad type. Main to late crop, white flowers that will set seed pods. Large crops of long spuds (up to 10-11’’) with creamy yellow skin and flesh. Home saved seed. 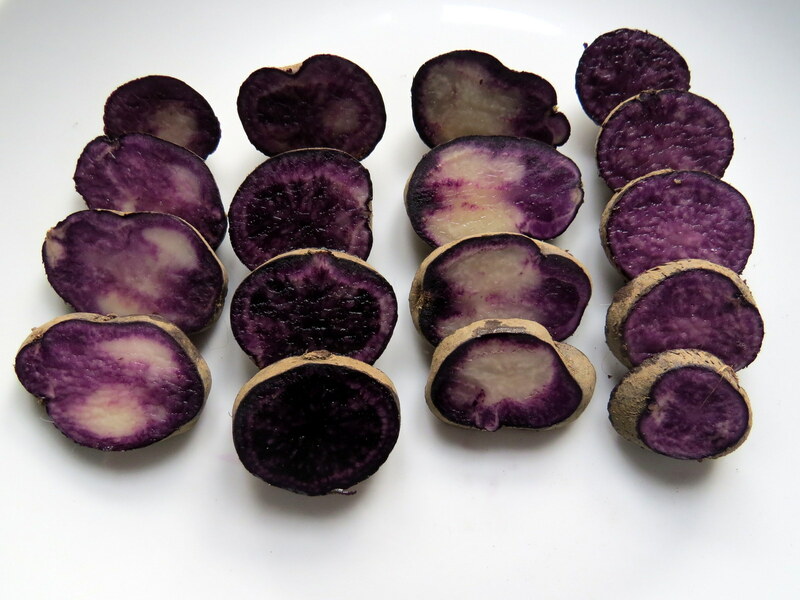 Vitelotte – A heritage late main crop variety with dark blue/indigo black skin and flesh. I’ve not found this variety crops particularly well here, others have better results. This year’s seed potato from Tuckers. Russian Blue TPS (F2) – Russian Blue and Skagit Magic seeds were from last year’s TPS sown plants which showed a lot of variety in colour and pattern, so who knows what will turn up? Snookie TPS (F1) – Snookie seeds from a tuber that jayb (who originally bred it) kindly sent me. I sowed mine in mid-March in a propagator with a growlight, in 7cm pots with just an inch or so of compost in the bottom, deliberately putting lots of seeds in to force them to compete really early. As they grew I earthed them up several times until the pots were full and then pricked out the individual plants into small modules. I don’t think you have to restrict them as much as I did, but I think it helped me to select the most vigorous young plants when I transplanted them into the beds, and they grew tiny tubers really early so I could select for tuber colour as well at that stage. The plants look on the fragile delicate side at first but they really grow fast once they get going. 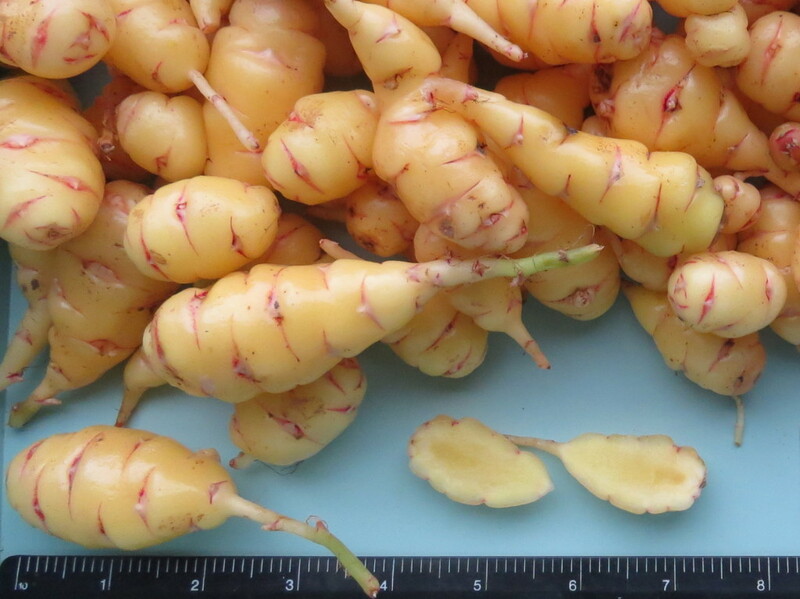 I got a decent amount of good-sized tubers from many of my plants despite planting at twice the density I’d normally give tuber-grown plants. 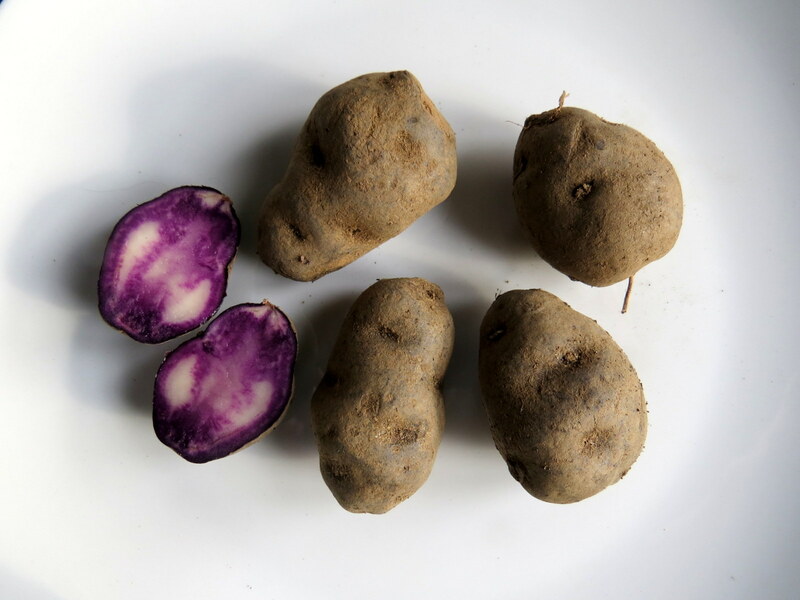 Galina adds: Potatoes from true potato seeds often do not give full yields in the year they were grown from seeds (although Silverleaf had impressive results in 2015), but in subsequent years, grown from tubers, yields will be like those from seed potatoes. For heaviest yields start early and transplant outdoors. But it is just as valid to start later and grow them in pots all season. The resulting tubers will be smaller, but plants from tps don’t mind being a little squeezed. 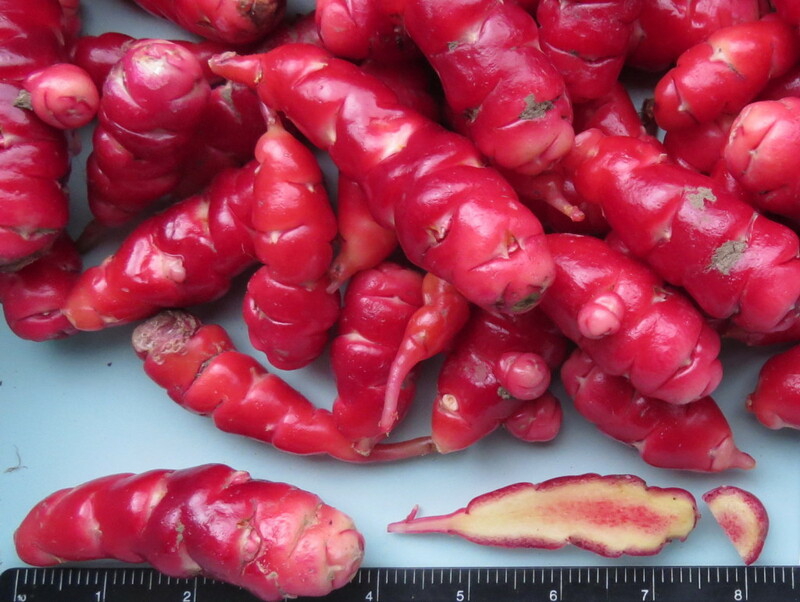 We can make our choices from pot-grown mini tubers just the same as from the larger outdoor tubers. Tps sown early and transplanted outdoors after the last frost can be spaced a little closer than normal seed potatoes, because the plants only have one stem. As the tubers we get are from true potato seeds that came out of potato fruits (which look a bit like small green tomatoes), they can be used as seed potato tubers for several years, before viruses may limit yields. Standard certified seed potatoes are years older than our tubers from tps. Not many potato varieties flower and produce berries (with seeds), but obviously these all did. There is a good chance that new varieties grown from these true potato seeds may also flower and fruit. Then we can harvest tps from the varieties we like best and start the cycle all over again. 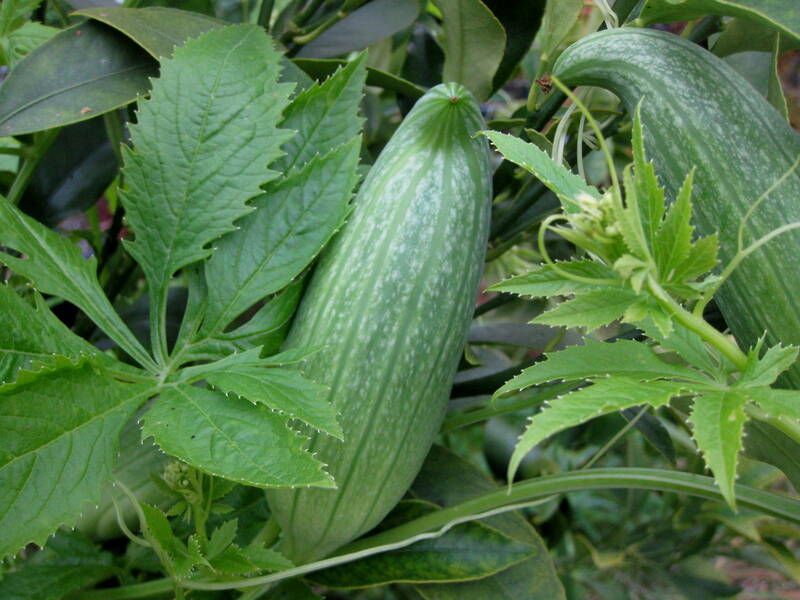 Cabello de Angel Squash (cucurbita ficifolia) – these squash are also known as Angel’s Hair squash, Shark Fin Melon or even Fig Leaf squash (because of the shape of the leaves). The fruits are very pretty, almost an oblong in shape with green with creamy white stripes/splashes. The seeds are black and the ripe fruits have stringy/spaghetti flesh. I don’t much like them to eat! I’m sure others would disagree and the are famous for a variety of dishes from jam to soup. They produce lots of flowers which can be picked and stuffed. They are vigorous fruit producers on long trailing vines, which will ramble up and over too. 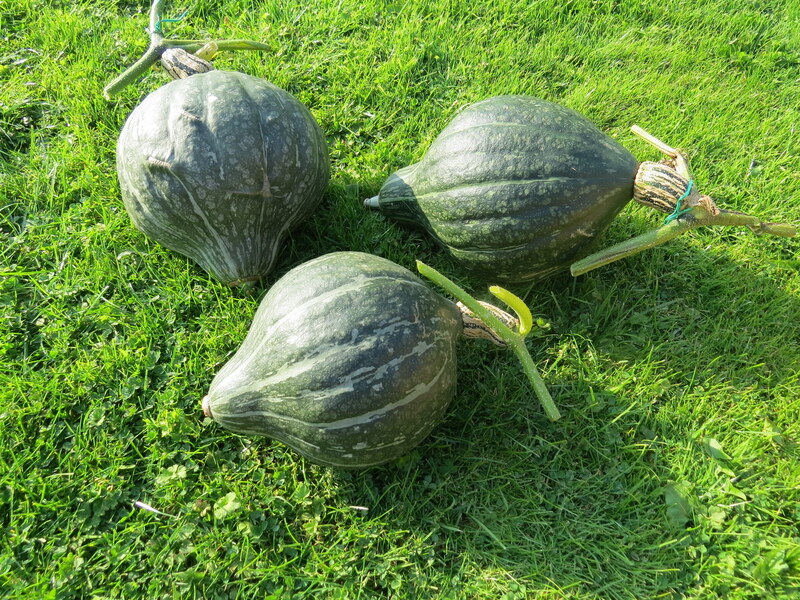 They manage cooler conditions better than other types of squash, useful as a rootstock on which to graft onto. Flat White boer (c maxima). Picture Sparrow. “This is a fast growing squash, sending out vines that are about 6m long. 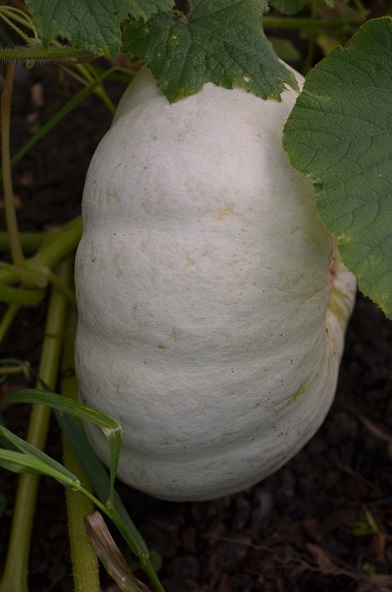 The squashes are beautiful – a really pure white, which looks very striking against the green foliage. They are fairly big, growing to about 3-4kg with yellow flesh inside. I think they taste fantastic, very like sweet potato and they are definitely on my ‘must grow’ list now. The insides are quite meaty – I may have opened mine a little too early from the green edges to the rind, but it still tasted amazing. Sliced Flat White Boer. Picture Sparrow. There are 2 types of White Boer, van Niekirk and Ford. I don’t know which I have, and the lovely people at Baker Creek couldn’t tell me which strain their grower had sent them. ” Sparrow. Geraumon Martinique (c moschata) – “is supposed to originate from the island of Martinique. 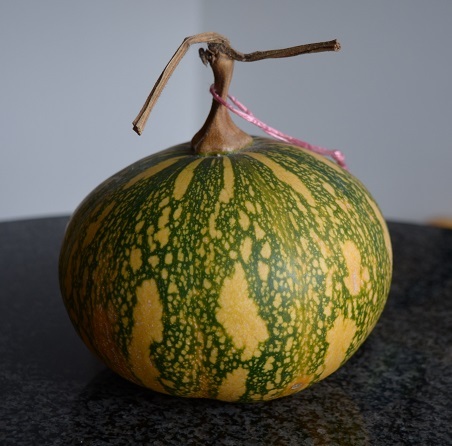 It is a beautifully marked squash, starting as stripes of dark and pale green/white. The lighter green markings turn salmon pinkish in storage as the fruit matures. 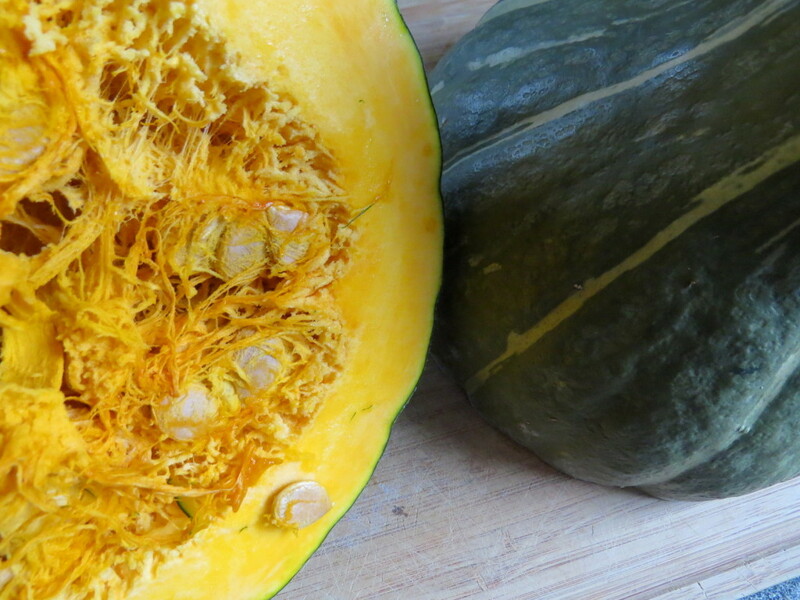 It’s not a big squash, or at least it wasn’t big this year – just enough for two meals as a side dish for two people. The flesh is smooth, yellowy-orange and sweet, it roasts and mashes well. Seeds also came from Baker Creek originally.” Sparrow. Pretty sliced in half. Picture Sparrow. Japanese Pumpkin (c maxima) – These are long trailing vines producing a fair crop in the lousy summer of 2015. They are storing well and very delicious to eat. Roasted in the oven with a drizzle of olive oil. they come out sweet, creamy, silky smooth, with the flesh remaining moist but not wet. My seeds were originally sourced from ISSA so well adapted to local conditions. They produce fruit in the range five and a half to eight pounds range. 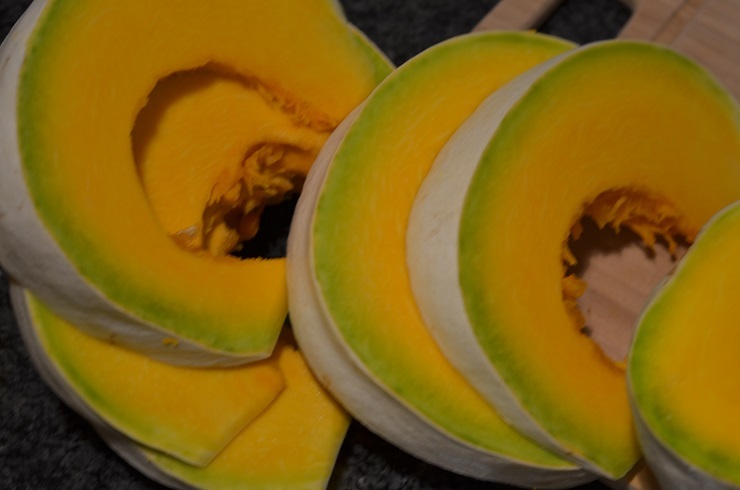 Japanese pumpkins a gorgeous shape with dark green, slightly striped fruit sometimes turning orange. 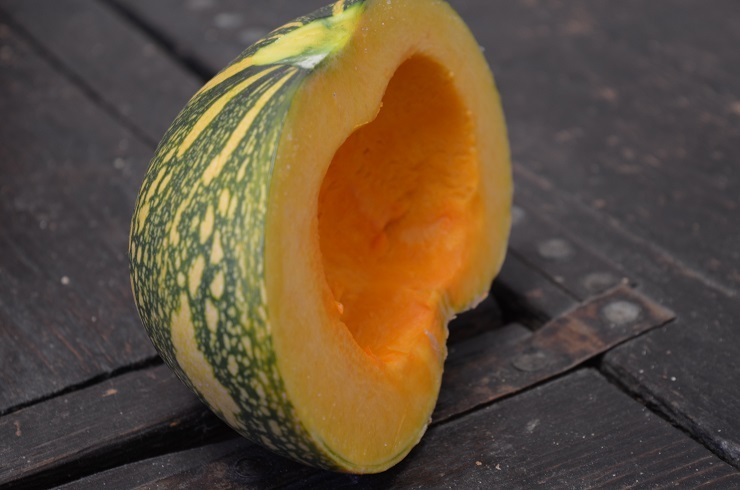 Lower Salmon River (c maxima) – A Maxima squash sourced from Adaptive Seeds. These are suited to cooler wetter summers and did quite well growing in Wales 2015. Attractive looking yellow fruits ripen to salmon-pink. Skins are quite hard and take a little effort to open, but great for storing. Flesh is orange and tasty, good roasted. 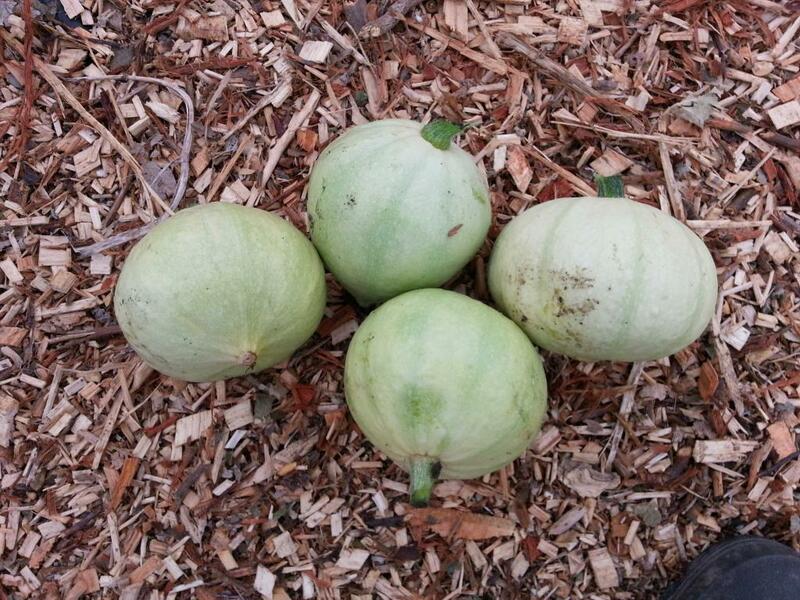 These seeds came from a 12lb fruit, though they are normally around 4-10lb mark. 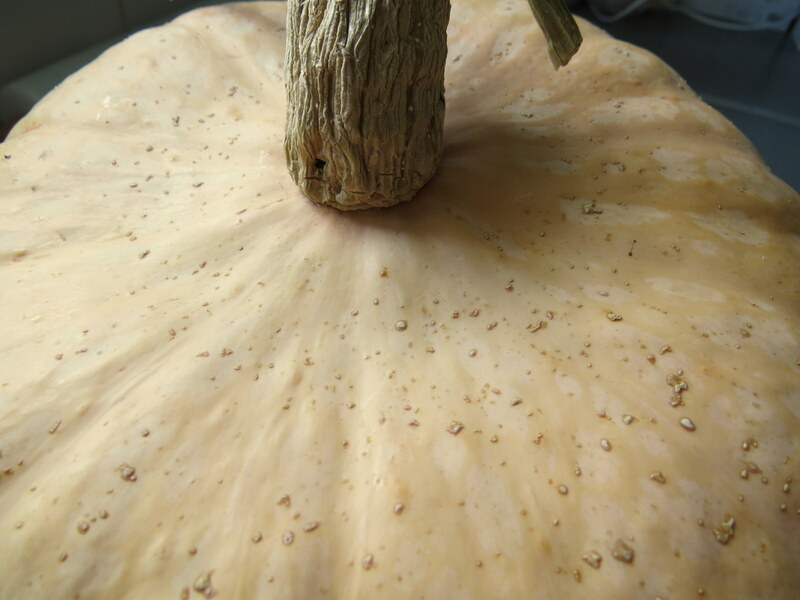 Pumpkin from Marocco (c maxima) – Ruud got the seeds from a friend who has been to Marocco and collected them there from a local pumpkin variety. 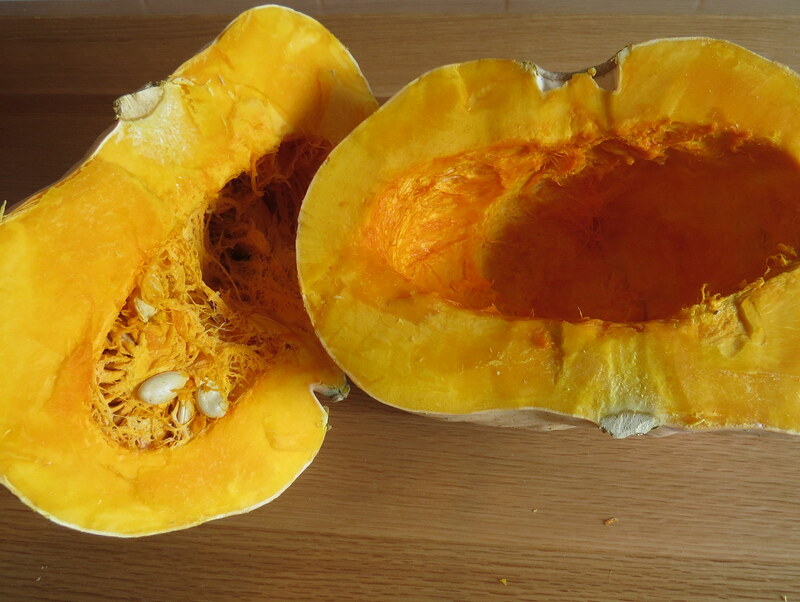 They taste sweet and great for making pumpkin soup. Desi Kaddu (Round Asian Courgette) aka Chappan Desi – delicious, sweet and meaty courgette from Asia that clumsy grows every year. Round Asian Courgette. Picture Clumsy. Plaza Latina Giant Green – the fruits are amazingly huge in comparison to regular types! Easy to grow in a sheltered sunny spot, they cropped well and have earnt a return growing spot for this year. I misplaced a pack of these seeds so not many to share. If you like them you’ll have to save some seeds. 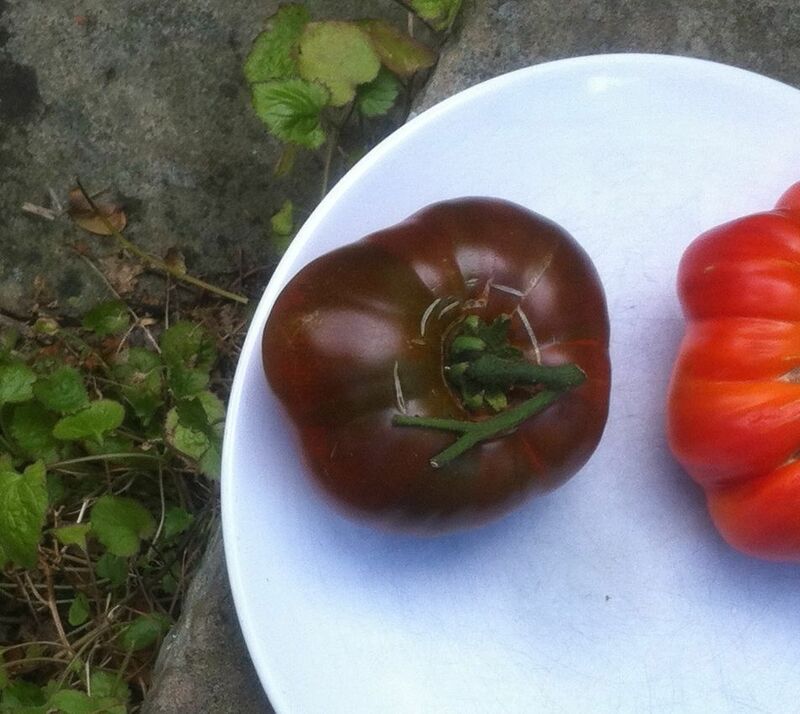 Crimson Crush F2 – Crimson Crush F1, hailed by some of the seed catalogues as the first truly Late Blight resistant tomato. Certainly the plants I grew 2015 were affected by Late Blight, but they did show resistance grown in a prone area for LB. These F2 seeds won’t produce plants that come completely true to the F1 parent, but like the parent, the plants should grow and produce well grown outside and some may have good resistance to disease. Crimson Crush F1, strong healthy plants grown outdoors. Picture Jayb. Delicious – these really are a ‘delicious’ tasting tomato and produce a good crop of beautifully red, large tomatoes. They just taste so good warm from the greenhouse. Particularly good sliced and eaten on bread or delicious simply diced with a little seasoning, oil and vinegar. They are a cordon variety, I grew mine in a greenhouse, they were midseason and seemed fairly trouble free. One I’ll be growing again. This didn’t do so well for me in 2015, but it is interesting as it’s one of the new dwarf types bred by the online dwarf tomato project. It should be somewhere between a bush and a cordon. It had a bad year with drought, trampling (a fox maybe?) and torrential rain in the latter stages. It was extremely productive and the first couple tasted excellent, but once the weather cooled and it rained incessantly in the ripening stages it just tasted weak. Medovaya Kaplya – the name translates to Honey Drop which is apt. 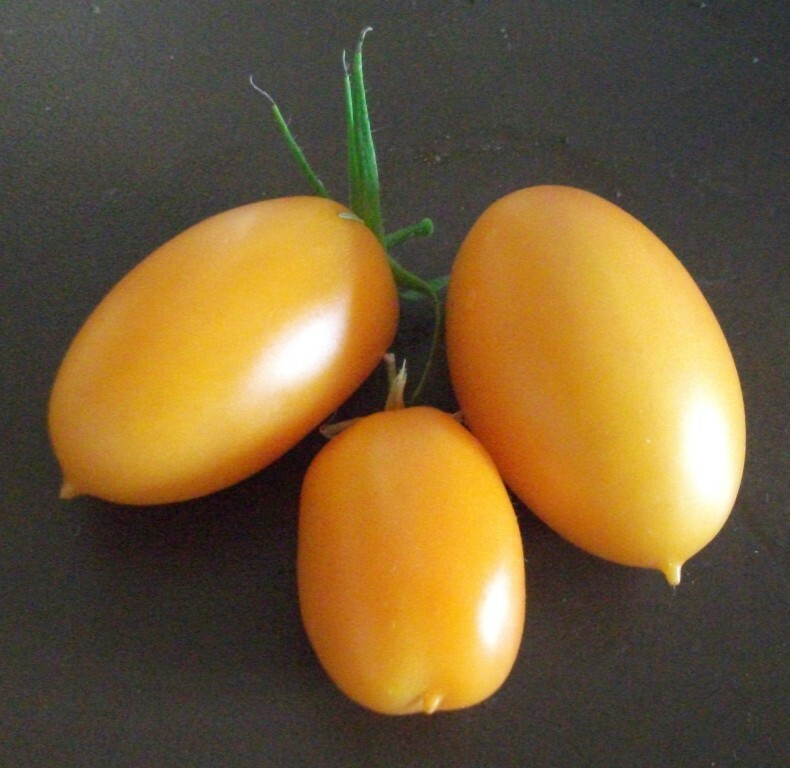 These are delightful, producing gorgeous cherry sized yellow pear shaped tomatoes, which grow on a cordon vine. Seeds were shared with me by Carolyn Male from the US several years ago and they have turned out to be a firm favourite here. Good production, though the early tomatoes do not have the flavour and sweetness of those ripening mid-late season, they are divine! Produces to the first frosts. They taste nothing like the mealy ‘Yellow Pear’ variety. For me large, early and jewel-like! First one cropped 25th July weighing in at over 1.5 lbs. Here’s what I said about the flavor at the time in a post. Historically this is a pre-columbian Mexican heritage tomato. Paul Robeson – Determinate/Black Russian. 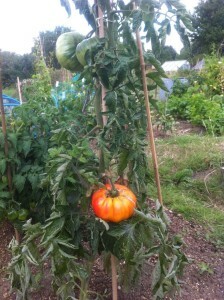 Quite a short plant (3 ft maybe) and not very productive (5 or so toms each), but so worth it! 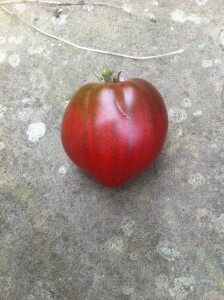 A very early, medium-sized oblong, blocky, beefsteak, with extremely dark rich black colour over deep red. Tastes superb, intense, juicy, salty. A revelation for me and a definite keeper. My season was odd with drought and a long holiday at the initial stages where they weren’t watered properly so they could be more productive in better conditions. History is also intriguing. This is from Tatiana’s seedbase. Sosulka Oranzhevaya – (indeterminate), which translated means Orange Icicle, is the third variety of the wonderful ‘Icicle’ series shared within this circle. Again bred in the Ukraine. My seeds were from the magic big seed parcel that made the rounds a few years ago. This ‘icicle’ has not quite the same shape as the Black and Pink Icicles, it is an elongated plum with a tiny peak at the base, but oh! the flavour is all there. We loved this one as much as the others – delicious, pretty and sweet. Sosulka Oranzhevaya aka Orange Icicle. Picture Galina. Vince – It all started with a packet of seed from the HSL clearly labelled Vince (tomato) so I googled and could not find any references so I contacted HSL they said their source was John Yeoman and they were sticking with Vince – although Jeannine came up with a match and it’s named Vincent ……. Galina kindly contacted John Yeoman he confirmed the name Vince!!! Silverleaf – Barley, true potato seed from Russian Blue, tps from Snookie (a potato bred by Jayb), tps from Cara, tps from Skagit Magic. Hannan Popbean (black-seeded pop-able chickpea), Landrace Broad Beans. Sparrow – CFB Lazy Housewife (white seeded), Squash Flat White Boer (c maxima), Squash Geraumon Martinique (c moschata). Galina – Autumn Olive, Hot Pepper Sipka Belaja, Cinnamon Vine, Litchi Tomato, Pea Kool’s Langstro Rozijn, Pea Robinson, Pea Mrs Lei, CFB Blue Coco, Salsify, Lettuce Bath Cos, Lettuce Cimarron, Tomato Sosulka Oranzhevaya, Walking Onion. Pumpkinlover– CFB Ryder’s Top of the pole, DFB Vermont Cranberry. Earlypea – Red Swan DFB, Vegetable Mallow, Dwarf Tomato Purple Heart, Tomato Paul Robeson, Tomato Oaxacan Jewel, Root Parsley Atika. 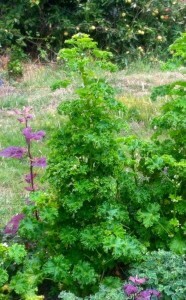 Martinburo – Greek Cress, mixed Parsnips F3, Marjoram. Jayb – Lantern Chilli, Lower Salmon River squash, Japanese Pumpkin, Cabello de Angel Squash. Achocha Giant Bolivia, Trofeo dfb, Mariazeller dfb, Plaza Latina Giant Green tomatillo. Tomatoes Medovaya Kaplya, Delicious, Crimson Crush F2. Trial Oca Varieties Redley, Pobbles and Bracelet and potatoes Alouette, Highland Burgundy Red, Snookie, Vitelotte.